I just got back from PAX Australia exhibiting Reign at the TGDA booth and it was absolutely amazing. Let me tell you a little about it. I left on a 10 hour train trip Wednesday night from Sydney to arrive in Melbourne early Thursday morning. After wrestling sleep from the clutches of a small chair and an ever-shaking carriage, I wandered around Melbourne until the TGDA DevCon that night (an annual pre-pax gathering of the Aussie tabletop industry). Tabletop game designers, artists, publishers and distributors from around Australia discussed what the future was going to look like for the growing tabletop industry. There is definitely some cool things about to go on in the next year and if you are an Australian game designer and haven't joined us on Facebook already, you should, everyone there is extremely helpful. Then on Friday the Pax-a-ning began. We started with 300 show bags and booth in the tabletop area. My first demo was at 4pm so I had some time to kill and take in the sights, the computer and console lines were insanely long so I instead opted to go and play some board games. Some were early prototypes like Cast, a deck drafting, sword and shield swinging card game. Others were more complete such as Remarkable Rhymes of the Traveler's Times, a poetry based, family friendly, cards against humanity style game which is on on Kickstarter right now! These games are quality and it goes to show that Australian game designers are an extremely talented bunch. Then came 4pm and it was my time to demo Reign. Instant praise. People were getting really into the spirit of the game and were enjoying the diplomacy, deceit and back-stabbery that was taking place. One player even betrayed another openly (admittedly by accident) but the imagery of him looking into the eyes of his friend as he poisoned their military's rations sent laughter around the table. I continued to demo Reign the whole convention. A lot of the feedback for Reign came from fellow game designers and also graphics artists, some event cards now have a small wording change for that extra bit of clarity, and military cards are having their symbols increased in size to help those who are colour blind distinguish the card's house. The only rule change was increasing the bonus received by having a military card of your house (from +1 to +2), making your choice of house more meaningful in the Influence Phase (for a full rules rundown check out the rulebook posted in September's blog). Nearing the end of the convention we still had almost 200 show bags to move so Wez (designer of Cogz, RAEZ) and I merchandised the booth a bit more and they started selling like hotcakes. I mean if a $5 show bags that came with two awesome games (Viewpoint and Ninjitzoo), a cool podcast (Dicehard) and an USB with tonnes of print and plays wasn't easy enough to sell, all the money is going to helping the Australian game design community. We ran out in a few hours. Then it was sadly time to head home, exhausted but fulfilled. A big thanks to everyone who took the time to sit down and play a game of Reign at the convention and to all those who worked so hard getting PAX and the TGDA organized. P.S. those inflatable balls in the waiting line are brutal, please use softer balls next year. A lot of hard work has gone into this booklet and I hope you enjoy giving it a read. More information and goodness to come. I first got into game design when I was rather young. My uncle used to invite his friends over every month or so to play Dungeons and Dragons. I was always in the corner listening in on their sessions. I wanted so badly to play along with them. After relentless nagging, my uncle finally allowed me to let me play as one of the bad guys, an orc named "Gurnak" and while Gurnak was killed in glorious battle (I put up a decent fight) my passion for the game lived on. When I was in primary school, I remember spending hours looking through the 3rd edition D&D rulebooks and appropriating a rules-lite version to play with my friends. Ever since then I have been modifying rules and designing games. The idea for Reign came about after talking to a friend of mine. We were discussing an interesting game mechanic which involved one player being in a position of power. This player would be a "King" who was at an obvious advantage. While he gained an increased amount of power and cards, he could also distribute them to the his lesser "Lords" (other players) for promises of support and future benefits. With that, I started designing. With just a basic pack of playing cards I created a quick prototype. Each suit was a different royal house and the numbers on the cards represented the card's strength. Cards were place in front of players facedown and it was all extremely secretive and diplomatic. However, the most important aspect of my first prototype was that it was fun! I knew I was onto something good. I continued to worked on Reign on and off (instead of studying) for several years. The first major change to Reign came when I implemented my first custom prototype cards. I simplified the strength of units from 1 to 5, gave some cards special abilities and added house support cards that players had to secretly bid for. Without a support card, players wouldn't be able to win the round. There was still tonnes to test, a lot of games needed to be played, luckily I was not for lack of playtesters (thanks to everyone at the Wollongong University card tables). We added and removed things during this period so quickly that I can scarcely remembered all the details. The most important concept that was solidified in this period of testing was having two turns for backing. First, everyone would play up to one card facedown in front of the player they wished to back for that round. Then, after all players had a chance to play, each player could play up to two more cards facedown. There were games in those early days that were extremely memorable, with victory or defeat players would cheer and shout. But something was missing, there was not much in place to allow for the all important: sudden but inevitable betrayal. I had to fix this. They have like 3 peasants... I swear! I needed to get that feeling of political intrigue and sabotage in my game and that's where a new type of card, events cards, came in. I had a lot of the basic mechanics of the game solid, so I began adding cards for players to use that would either hinder or help the person it is played in front of. However, these cards came with varying degrees of success. It took a lot of time to test each one and make sure there wasn't a event card that was simply better than all the rest. During this period I also changed the mechanics for the first round of backing. The first card placed would be face up for everyone to see instead of facedown. This allowed players to make much more informed decisions in the second round of backing. After testing, everything was starting to come together. It was time to tweak the numbers. 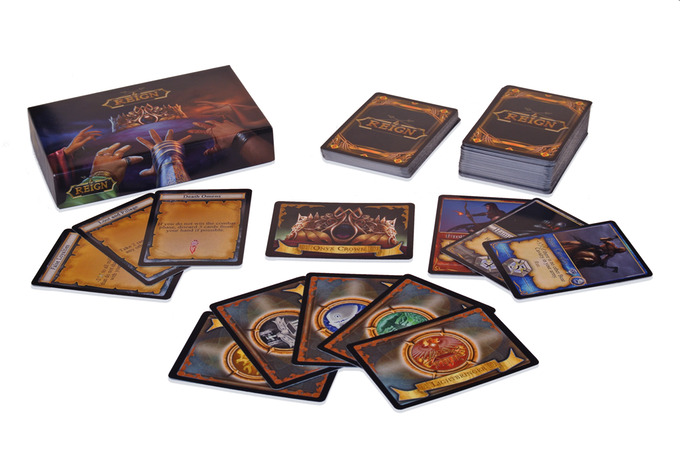 Reign is primarily a small card game consisting of 108 cards. Any higher or lower and the manufacturing would be inefficient and not cost effective. With that in mind, I wanted a standard game to last around about 45 minutes. In testing Reign clocked on average, 1 hour and 10 minutes. I needed to make the game shorter. It all came down to how a player gains legitimacy points. A player needs 9 of these points and the Onyx Crown card to win the game, if you won a single round and became Regent you would take the Onyx Crown card gain 3 points. If you helped someone win a round you would only get 1 legitimacy point. The fix that cut almost 30 minutes from the game? Increase the amount of legitimacy points a player got from helping someone become Regent to 2 points. With this addition games became faster and more intense. In the interest of keeping you sane, I left out a lot of the minor changes that I did to Reign along the way. The changes I made could fill a book. I have to stress just how much goes into making a game polished. It is hard work and it will make you frustrated beyond belief but seeing your game in the "flesh", in all its polished awesomeness is one of the most rewarding experience I have even been through. Well, that's everything for this week, next week I will be talking about the Australian convention scene and the experiences I have had.